This is such an amazing book. I don't remember how long it has been since my last book hangover. I was so sad when I reached the last page. I just couldn't believe it, I was just reading it a minute ago or maybe two hours ago I can't quite remember. I've lost track of time because the story was so captivating that I had to read it in one go. And after finishing The Burning Sky, I found myself keep thinking about the book and can't keep Iola and Titus out of my head. It took me a while (few days to be exact) to clear my head so I can start on my next read. Sherry Thomas knows how to create characters that you can't hate. I loved Iola and Titus right away and throughout the book I've fallen hard for both of them. And I really liked the love interest here, yes it's predictable but it's not the inst-love. It's a slow built one and when Iola and Titus realize their feelings for each other, I was like YES at last---> it's just so cute that I couldn't stop giggling. The villain was barely introduced and for some reasons it didn't bother me at all. I was so into the main characters and their little adventures that I completely forgot about anything else. 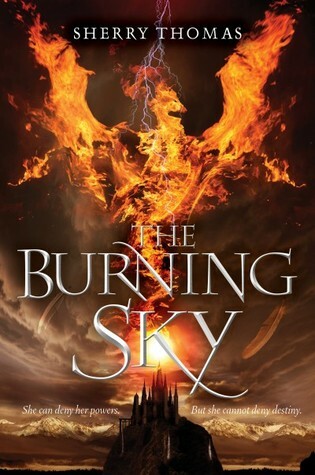 The Burning Sky is a high fantasy but it's really a light read. The plot is so interesting that you can't put the book down. And the romance, ah it will give you butterflies my friends. The characters are so likable that I'm sure they will win your heart the moment you start reading. This book didn't end with a cliff hanger but still I can hardly wait for the next book. I think you'll like this book so if you have time, check it out. This book sounds amazing! I love books that just captivate you and you forgot the world around you. It's indeed a nice feeling right =) open the book and fall right in----> I want that to happen every time I read. Hey I nominated you for the Liebster Award, so head over to my blog and see the questions you'll be answering.